Another Birthday has passed. My sister 'The President of Cookies' sent me this card. The bacon on top of the cake might explain a couple of things. 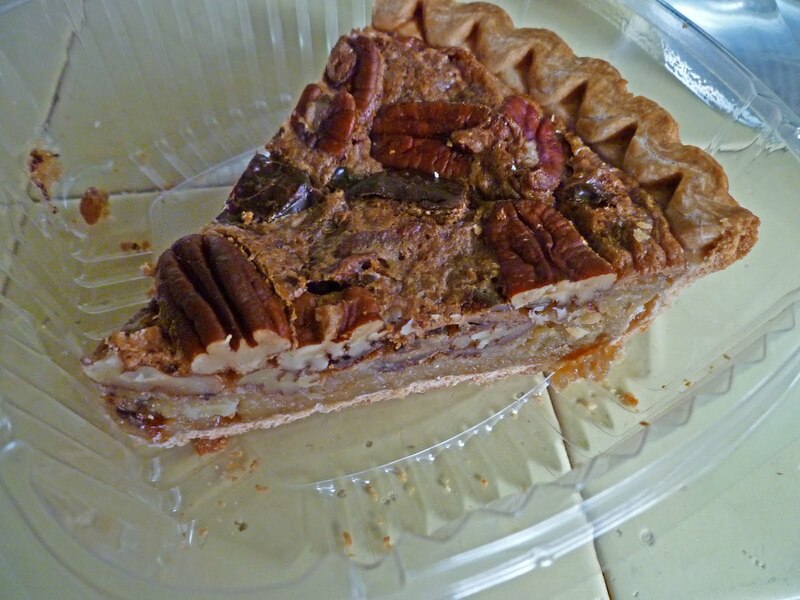 Ms. Goofy made me a wonderful chocolate pecan pie. Thankyou for all the Birthday wishes. I may be a year older but that has not slowed me down yet. A 'Meat Adventure' to Esparto California is planned for tomorrow. 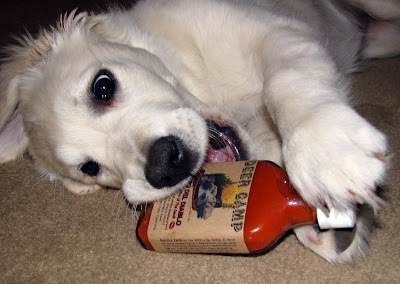 No puppies were harmed reviewing the latest hot sauce. 'El Beso Del Diablo', (Kiss of the Devil) is a scorcher of a tasty sauce. 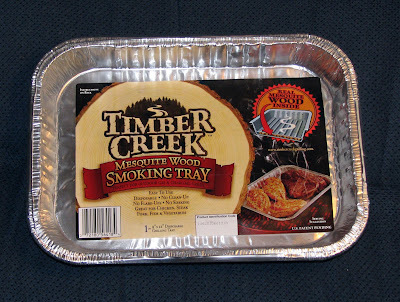 While cruising through the ‘Outdoor Section’ of a large chain discount store, I happened upon the ‘Timber Creek Mesquite Wood Smoking Tray. Why was I cruising through a large chain discount store? Do not ask. These trays were very inexpensive so I picked up a half dozen for research purposes. I went to Timber Creek’s website and found operating instructions and several recipes that sounded pretty good. These trays are simple in design and use. Two aluminum trays with mesquite wood pellets sandwiched between the layers. Some holes are punched along the seam to allow smoke to escape when heat is applied. The instructions recommend using 70 or more lit charcoals for a heat source. 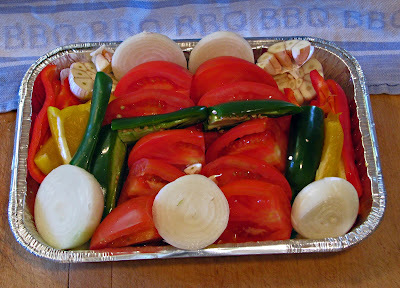 The also recommend a covered barbeque or use some aluminum foil to cover and retain the smoke. First up on the grill was some bacon wrapped Asparagus. The bacon was par-cooked and wrapped around several spears. 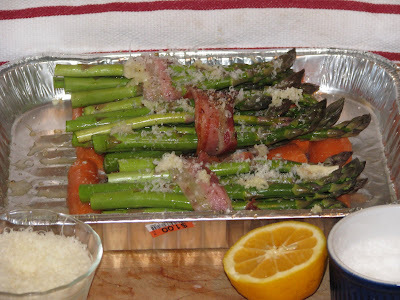 Lemon juice, olive oil, salt & pepper and a dusting of parmesan cheese was placed on the Asparagus. Some carrots were used as a makeshift trivet. This packet was put on the fire and covered. Fifteen minutes later smoky bacon wrapped asparagus emerged. A salsa was next up to the fire. This was cooked for 20 minutes. It was cooled and blended with cilantro, salt, sugar and a little lime juice. This was just what the doctor ordered. The smoke was not overpowering but very pleasant. 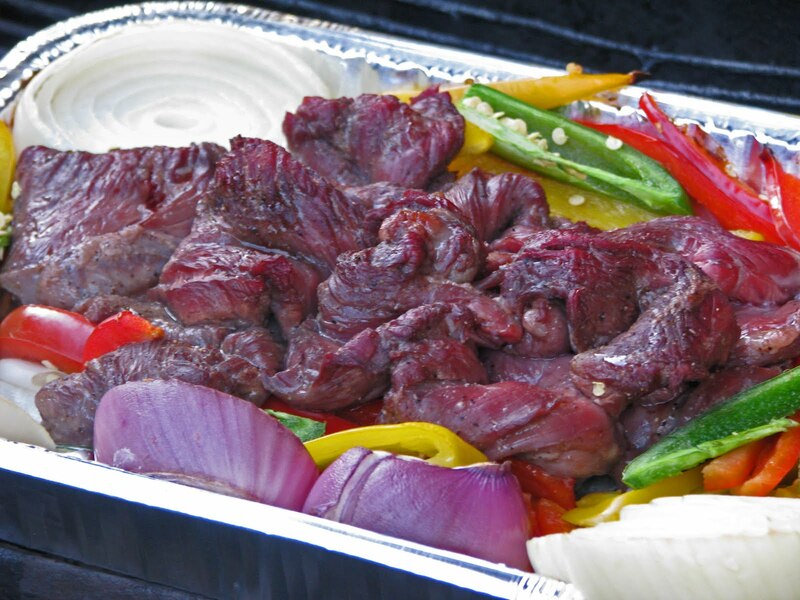 Last but not least some flap steak and fajita fixings were put to the test. I was a little disappointed because of the lack of carmelization and grill marks that a hot grate can deliver. The website did recommend searing your meat on the grill to start. I guess I did not read that part. Timber Creek Mesquite Wood Smoking Tray’s are convenient. Just toss the pan when done. I think this would be great for a picnic. They do use way to much fuel. I can cook and smoke the same amount of food with half the amount of recommended charcoal. I would recommend these pans if you are not familiar with smoking techniques. 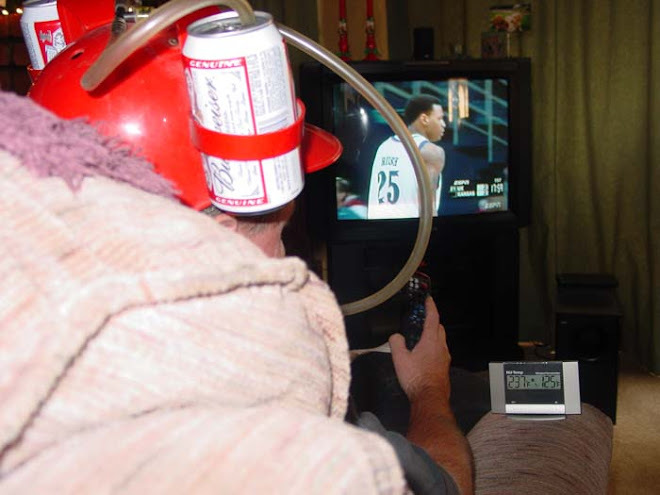 They are inexpensive and very convienient. Bacon is everywhere. Everybody is jumping on the bandwagon and cashing in on the bacon craze. I prefer to think of it as a life style. Once again we venture to the franchised world of food. Today’s bacon offering is a milkshake that is bacon flavored. Will it pass muster? The order was placed and we were able to watch our trained chef created this concoction. A ripple of soft serve ice cream was placed in our corporate labeled cup. A squirt of some secret syrup was added. This was placed in a fancy device that mixed this brew instantly. Where is the bacon? 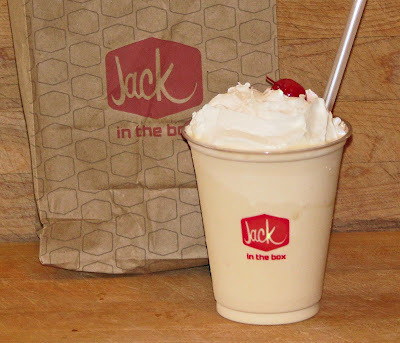 This milkshake did have a smoky flavor. I would even dare to call it bacon flavored. It was also cloyingly sweet from the syrup. A few sips and I was done. Needless to say the bacon milkshake was a disappointment. Where is the bacon? We will be cooking beef shank today, a Mad Meat Genius first. This was an experiment that sounded like some tasty fun. 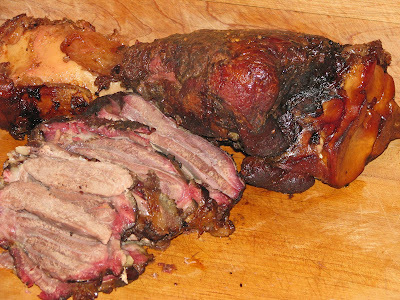 Beef Shank is usually braised because it can be very tough. There are tendons and fibrous muscle that need to be cooked low and slow in a moist environment. 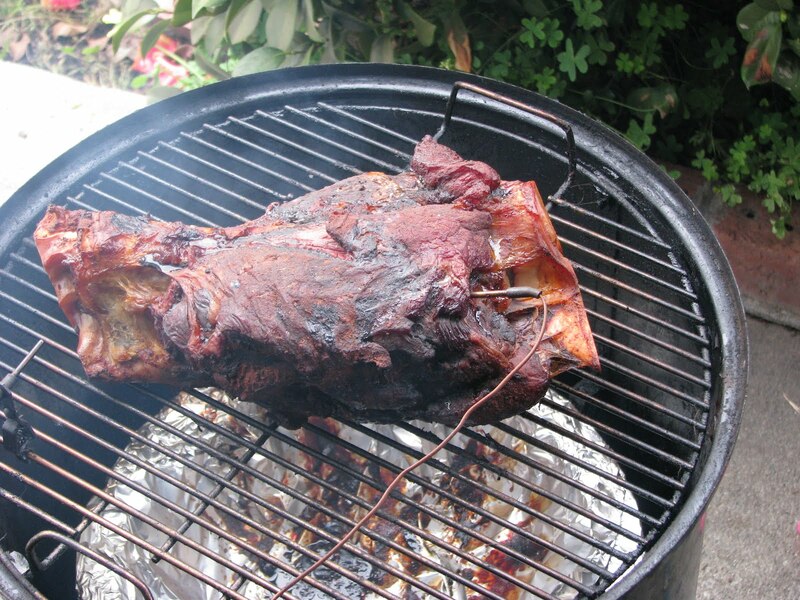 We will be cooking our shank low and slow in a Weber Smoky Mountain Cooker. 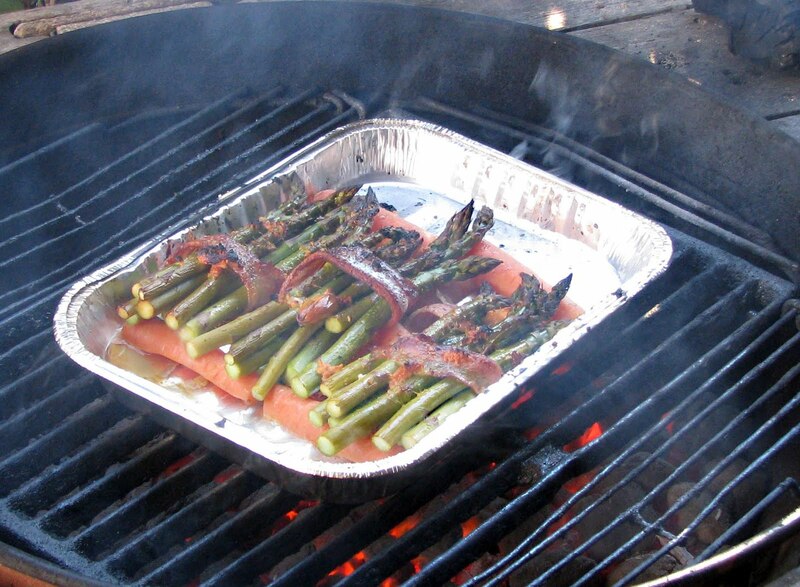 This smoker will keep the temperature hovering around 230 degrees for the cooking duration. 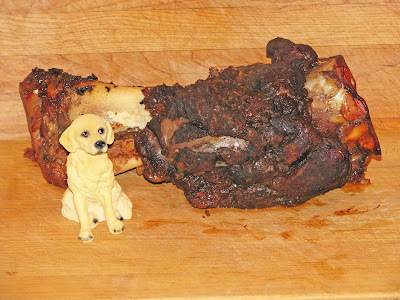 The beef shank first needs to be trimmed. There is a layer of fat and silver skin that needs to be removed. A sharp knife and a little patience is all that is needed. Some secret rub was applied and the shank was brought to room temperature. Today’s fuel will be a combination of charcoal, apple and hickory wood chunks. The cooker was brought to temperature and the Stoker was plugged in. Six hours of smoking and the beef shank was temporarily removed from the cooker. Several sheets of aluminum foil were spread on a table. Stubbs beef marinade and some more rub were applied to the shank. The meat was tightly wrapped and returned to the cooker. Wrapping the shank will achieve braising technique with its own steam. Six more hours of cooking and the internal temperature of the shank reached 195 degrees. The shank was unwrapped from the foil. The meat was falling of the bone. There was a pool of marinade mixed with beef shank drippings. This liquid gold was reserved and later made into smoky rich gravy. The shank was sliced with a sharp knife. We served our shank with garlic mashed potatoes and artichokes. The meat had a pot roast quality and texture. It did have a wonderful beefy flavor. This experiment was a success. We even had a lot left over. Several days later we took left over shank and made asparagus chow mein. Yummy Noodles! Our local 'Daily Rag’s' food section had an article about the Cara Cara Orange. I have to admit that I have never heard of them. While shopping at Berkeley Bowl West, Ms. Goofy spied them and they were acquired. They are similar to your every day orange in outward appearance but when you cut into them they have a pretty pink flesh inside. Cara Cara means beloved and I can see why. They are very sweet and juicy. The Cara Cara’s rosy color comes from lycopene a powerful antioxidant. 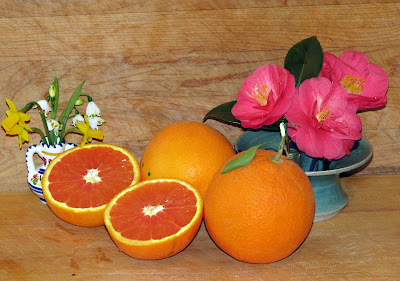 Consuming these oranges may or may not cure cancer and help stop global warming. All I have to say is they taste delicious. Go out and get some. Everybody loves pizza including yours truly. What could one do to improve a pizza pie? Of course! Let’s add bacon. 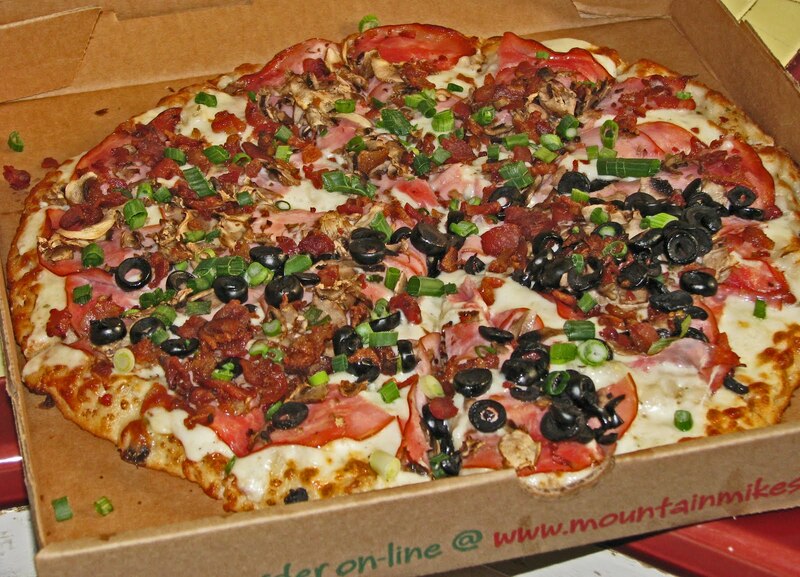 We have a new ‘Mountain Mikes’ pizza parlor in town. They have a pie called; ‘Sizzling Bacon Classic’. 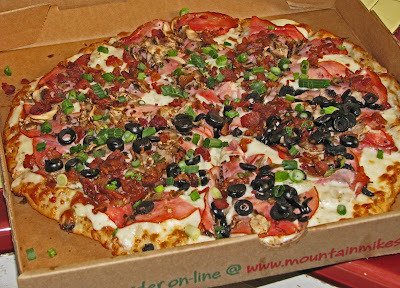 The ingredients are; Creamy garlic white sauce, chicken, bacon, ham, mushrooms, olives and green onions. I am not a fan of chain restaurants but sometimes they are just darn convenient. We were pleasantly surprised. 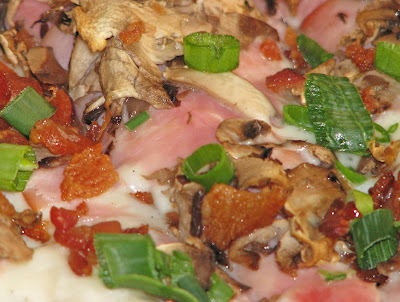 Ham, mushrooms and salty crisp bacon was a combination that worked. The sauce actually had large chunks of creamy roasted garlic. Bacon at fast food establishments are usually poor imitations of a true rasher. This bacon actually had great flavor was crisp salty and chewy all at the same time. Mountain Mike's, you now have a new regular customer. I usually have bacon on my mind but now I have it on my hands. This latest Mad Meat Genius acquisition is a hand sanitizer called ‘Porkkleen. This is an Ethyl (not Fred) alcohol based cleanser with a bacon scent used to decrease bacteria on your hands. My hands usually smell like bacon anyway so a sanitizer probably would be prudent. A small dab of Porkkleen was applied and rubbed into my hands. My schnozzola was lowered to my hands and I was overtaken by the Ethyl Alcohol fumes. After the alcohol evaporated and I closed my eyes and thought about images and fragrances of bacon, it might of smelled like bacon. I will stick to directly rubbing my hands on a nice smoky slab of cured pork belly for bacon fragrance. A few germs never hurt anybody. Some of you may know that I love Bacon and Barbeque. If you combine these two food groups you will have ‘Phat Matt’s BBQ’. ’Phat Matt’s BBQ’ is a restaurant located in Oakland California that specializes in smoked meats and throws in a whole lot of bacon. 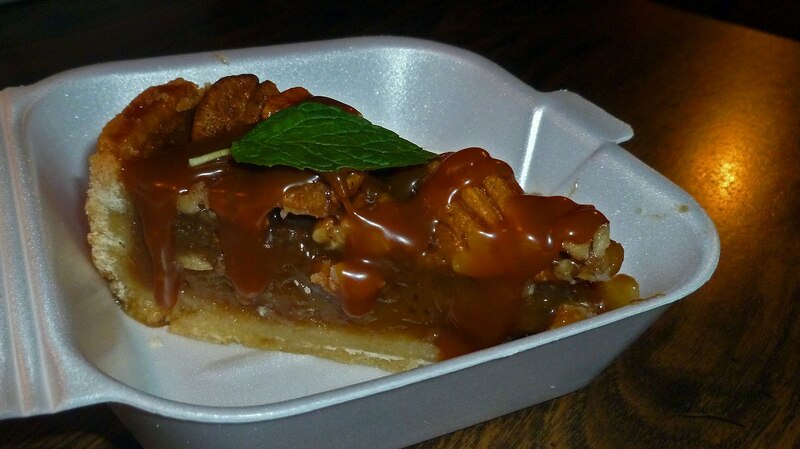 Candied, chocolate and bacon pecan pie will be offered at my new favorite digs. 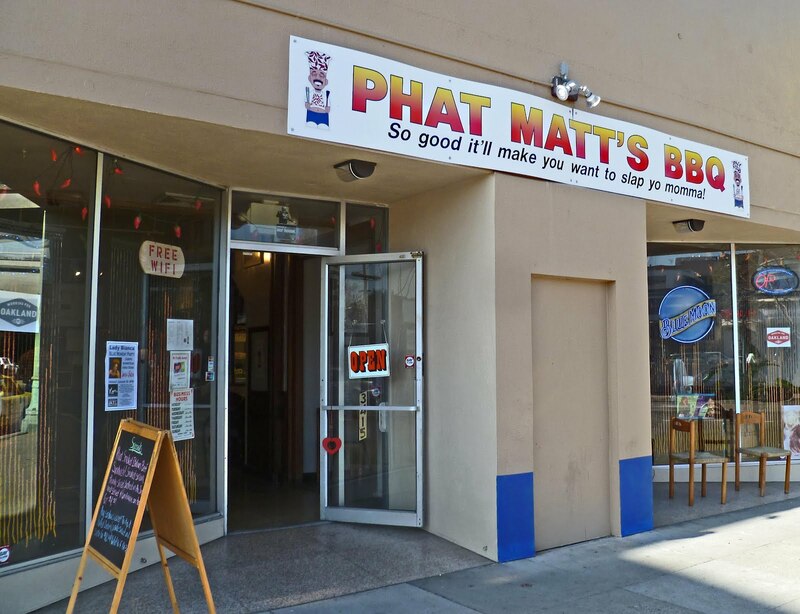 Their food offerings are so good, they claim; “So good it’ll make you want to slap yo mamma!” We can attest that this barbeque will make you do things out of the ordinary. We liked our first visit so much we returned the next week. 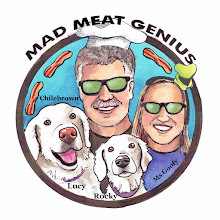 Matt and Charlotte Gonzales are award winning barbeque competitors and have become the proprietors of this smoked meat and bacon palace. A unique feature of the smoked meats is the absence of salt in the meat rubs. These salt free rubs were created to fill a dietary need of Charlottes. We did not even know or miss the salt because the meats were very flavorful. The barbeque sauces use all natural sugars. Be sure to ask Matt for a taste of the Ghost Pepper barbeque sauce. It will grab your attention and set fire to your taste buds. Let’s get to the tasty section of this story. 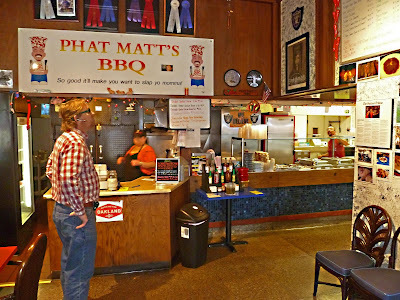 Phat Matt’s has weekly specials such as Italian beef or house cured pastrami. We returned to try the pastrami and were rewarded with a HUGE sandwich piled high with meat topped with yummy Cole slaw. The pastrami was tender and tasty. You will have to have a hearty appetite to finish this sandwich. The ribs were competition worthy. Always a judge now and I would score these very high. The brisket was fall apart delicious. 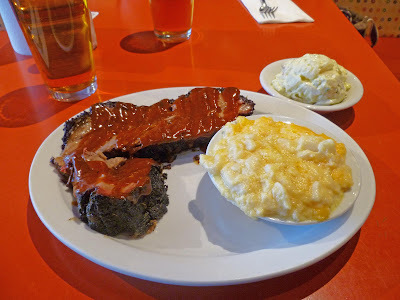 It was slathered with a flavorful barbeque sauce. We loved the exterior bark of this brisket. Ms. Goofy had her pulled pork sandwich which was as tall as a building. The smoke flavor permeated this tender pork. It was accompanied by a very creamy, macaroni & cheese. If you have room for dessert, which we did not and got ours to-go, bacon pecan pie is offered. This is decadence that could not be resisted. A few slices of candied bacon will satisfy any ones sweet tooth. 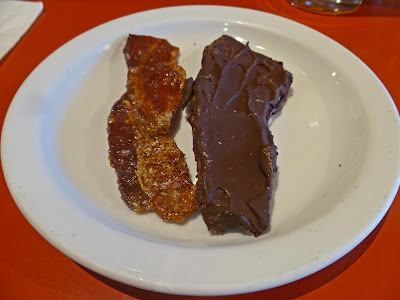 If that is not enough, chocolate covered bacon may help. Home made peach cobbler will be our next item to order. You know I have found a new home. Matt and Charlotte have a fun and tasty establishment. They have hit all my weak spots with tasty jabs. Bacon, Barbeque, Brew, Raiders what more can you ask for in a BBQ restaurant. We are planning our next visit to try the Italian Beef sandwich. You can sign up for their weekly specials and discounts. 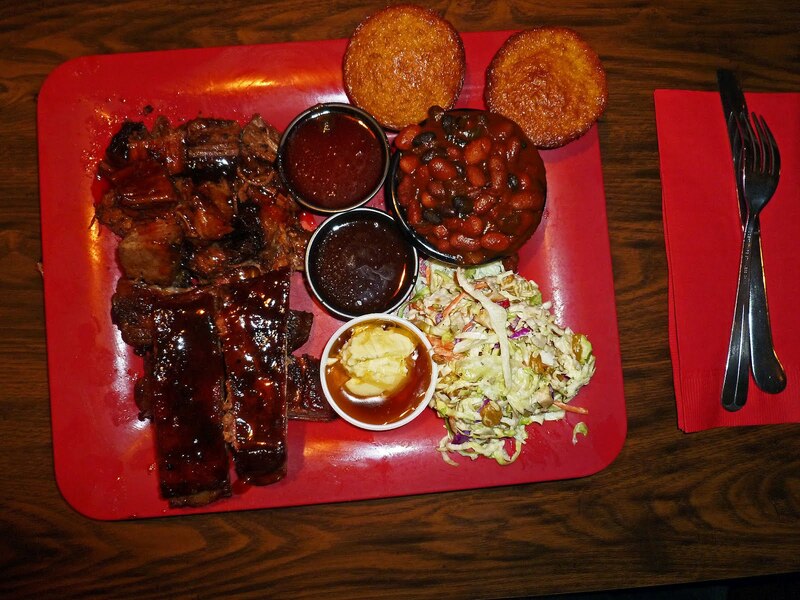 Stop on by for a barbeque treat. 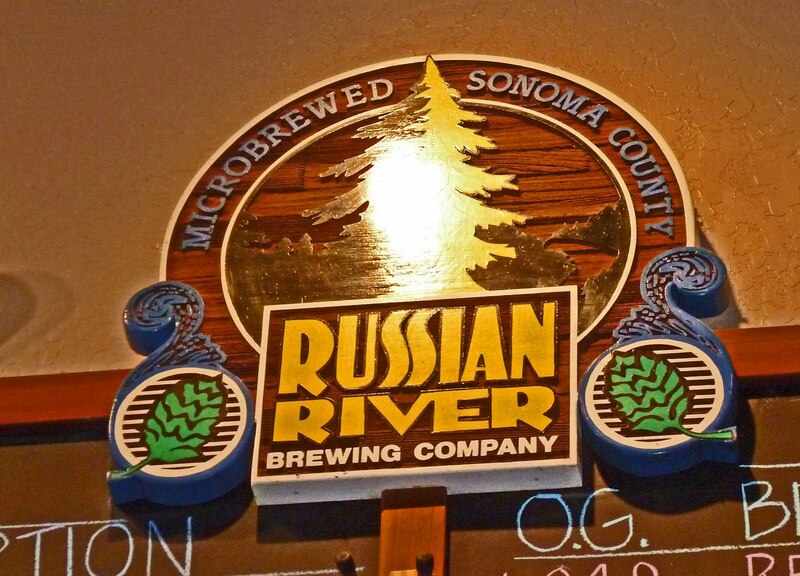 ‘Pliny the Younger’ not to be confused with ‘Pliny the Elder’ is a specialty beer brewed by the ‘Russian River Brewing Company”. 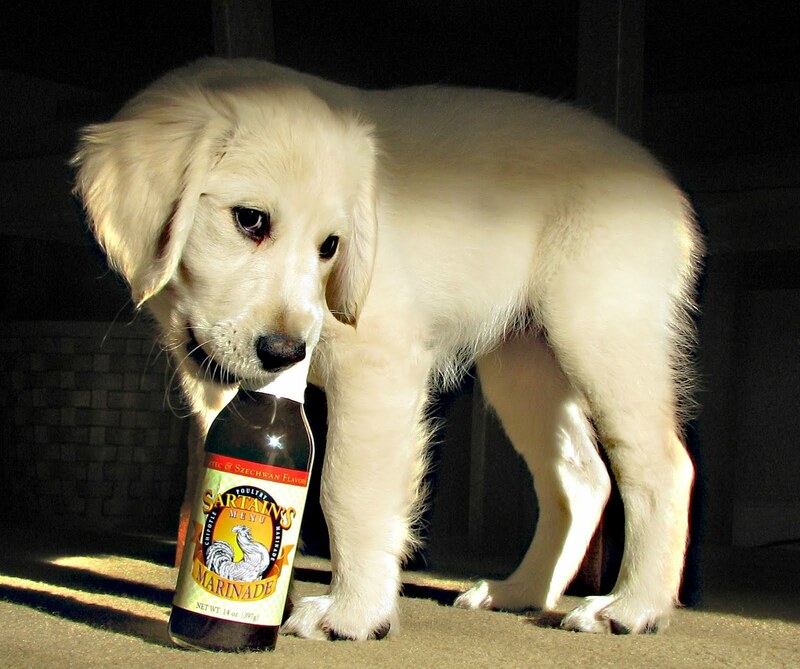 This special elixir of yeast, grain and hops is a fresh food product that is made only once a year. The demand for this ‘American Double, Imperial India Pale Ale’ is huge. This last weekend hopheads stood in line up to five hours to gain entry to the restaurant/brewery. We did not have to wait in line but it was standing room only this last Wednesday at noon. This brew is planned to be served for 14 days. So many kegs will be allotted for each day. 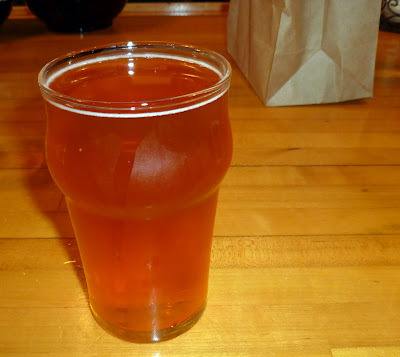 “Pliny the Younger’ is served in a 10 ounce glass. It is a beautiful golden color with a white foam head. It is not very carbonated and the foam subsides quickly. It smells of caramel and citrus. It may even have a nuance of pine needles. The first sip was so very smooth. It has a great bitter taste from the hops. This is a hopheads hop/malt dream. I need to mention this beer is eleven percent alcohol. It is so smooth that you do not notice the big alcohol content. I now know why beer enthusiasts pine for this specialty beer. 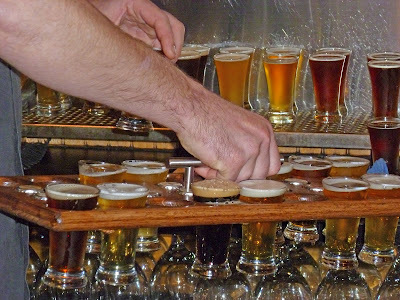 This is the beginning of ‘San Francisco Beer Week”. 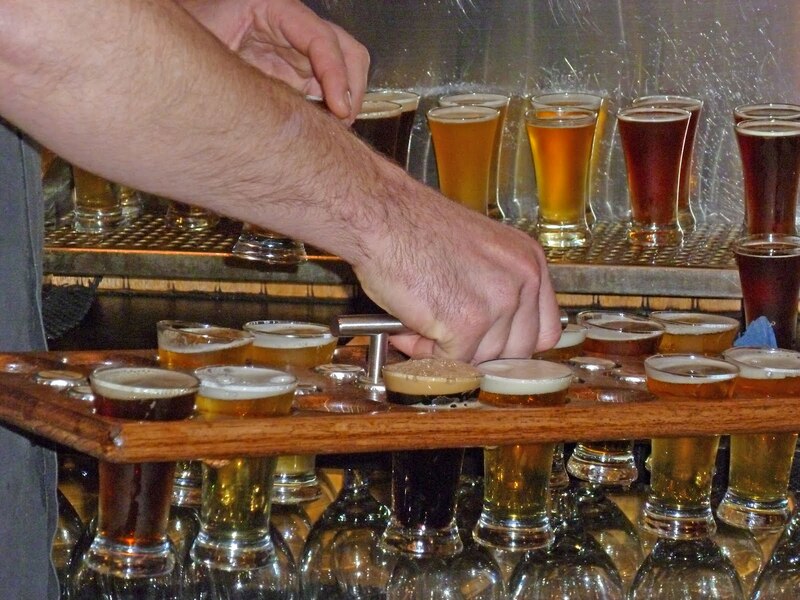 There will be beer events scheduled through out the week celebrating craft brewers. We will try to attend them all. Well at least some. 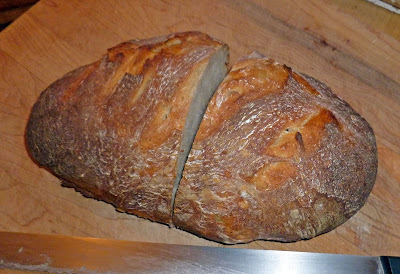 Sourdough and Iris's are not really connected but they are both happening at the Mad Meat Genius abode. Our good friend Zoomie gifted us some sourdough starter. 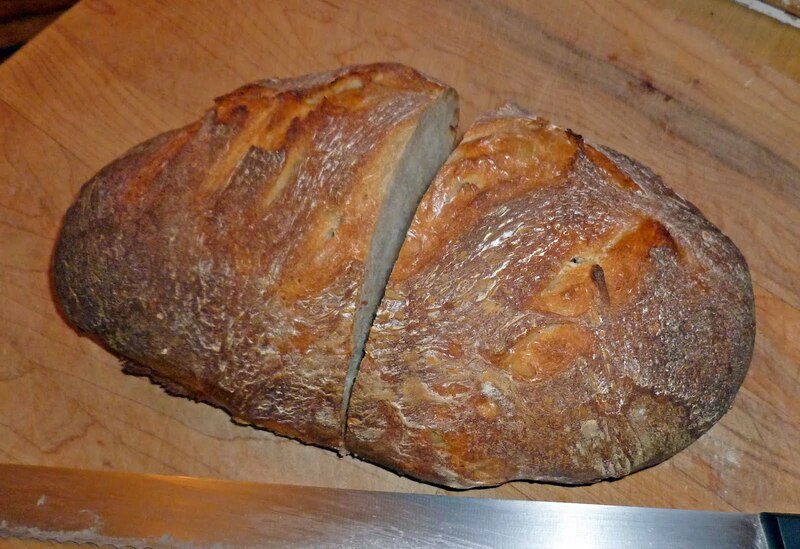 It was put to good use to create this tangy loaf of bread. 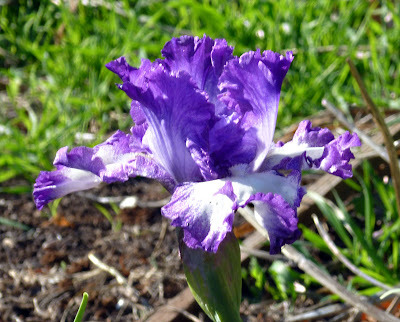 We spotted this Iris in the front yard. They both have brought us pleasure. Connected, I think so! We received a package on our front porch that contained a bottle of ‘Sartains’s Chipotle, Poultry’ marinade. This was perfect timing because we needed something special for the super bowl halftime snacks. Wings are traditional football snack and a marinade will add flavor and pizzazz. Sartain’s; claims to unite Aztec and Szechwan flavors to awaken the closet gourmet in us all. Now these two flavor profiles are not known to me. Some of the ingredients did grab my attention. The first ingredient of Tequila shouted out to my Super Bowl party side. It was followed by Chipotle peppers and honey. This sounds like a great combination. Ingredients: Soy Sauce, (water, wheat, soybeans, salt), water, brown sugar, (Chipotle peppers (peppers, water, vinegar, carrots, onions, sesame oil, salt, spices) molasses, lime juices, honey, garlic,(with citric acid), tomato paste, tequila, onion, natural flavors and spices, xanthan gum make up the list for ingredients. The instructions for use are very simple. Pour over chicken at least 30 minutes before grilling. We opted for several hours of marinating in the Chilebrown ice cave. 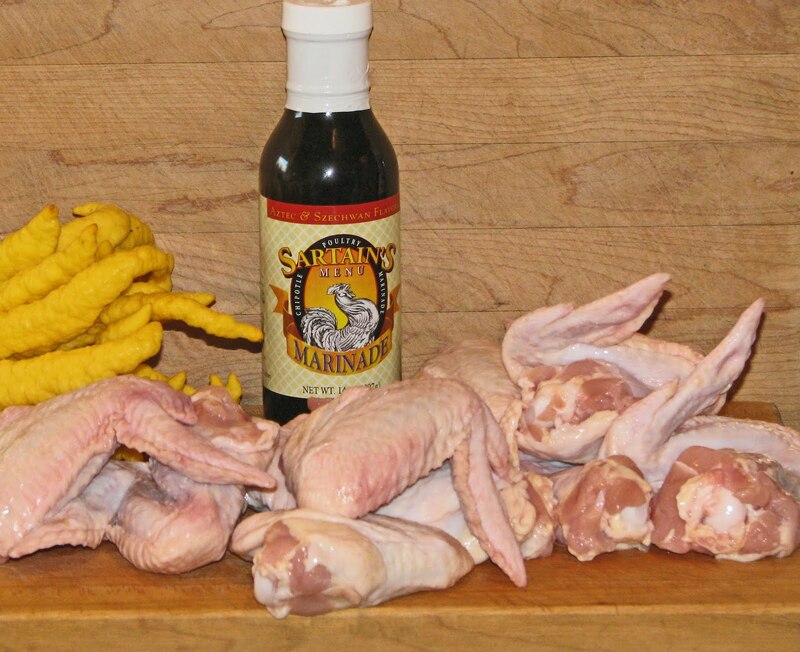 We tried a little sample of before pouring Sartain’s over the chicken. Soy sauce and garlic with a hint of tequila was our first impression. It was quit salty straight out of the bottle. The honey flavor did shine through. The real test will be on some cooked chicken. My bro-in-law Johnny and his wife Shastina were visiting and watching the big game with us. You may remember John. He owns a Harley and may let me ride it. I am hoping he likes the wings a lot so I can finally hit the open road on his hog. They were more than happy to be tasters in our evaluation of this poultry sauce. We built a medium fire of mesquite charcoal. The wings were placed on the grate and the cover was used. Several turns and 15 minutes later we had some bronzed chicken wing beauties. These wings were beautiful looking. The combination of chipotle, honey and soy melted together to glaze and flavor our chicken. Everybody unanimously gave thumbs up in the flavor profile. I could taste a little garlic but did not really taste the tequila. After cooking the salt level was perfect. The chipotle peppers did not put out a lot of heat. This was a good thing for our party. Overall this marinade was a success. Sartain’s Marinade would be a welcome addition to any of our barbeques. Let’s ask Johnny the big question. 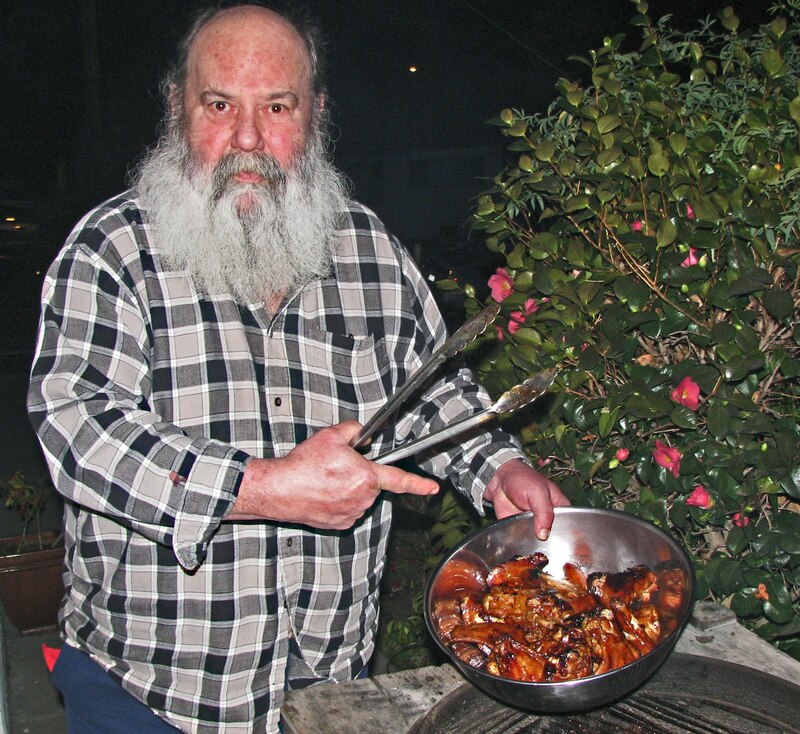 Chilebrown: Hey John, Did you like Sartain’s Marinade on the Super Bowl wings? John: Chilebrown, I loved them, but you will never drive my Harley. Today we will revisit a very tasty BBQ restaurant in Clovis California called ‘QN4U’. Our last visit was just a tease to entice us back. 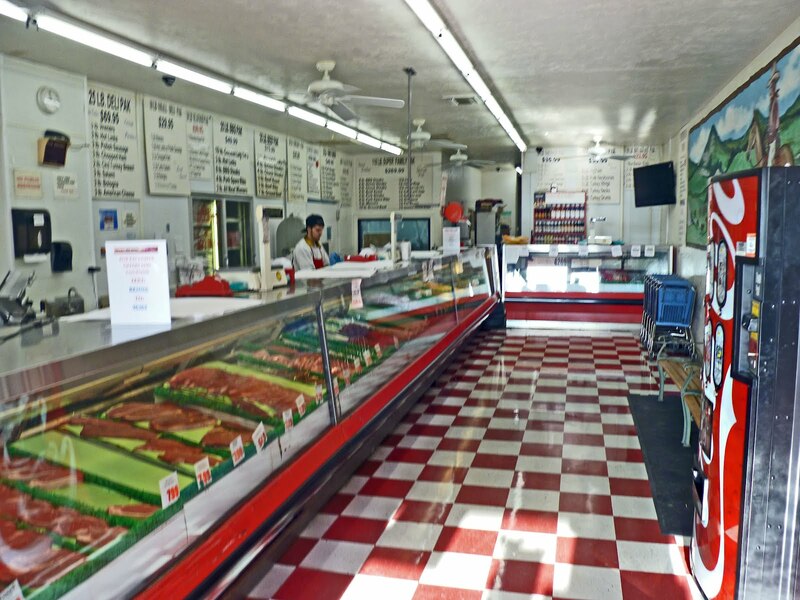 The only problem with this palace of smoky delights is the three hour distance from our abode. It was on the way home from our latest trip to Arizona. A hotel room a couple of doors down was procured to sleep off this meat coma. Walking into QN4U, the sounds, smells and sights will start the taste buds dancing. A couple of frosty mugs of our favorite beverage whetted our appetite while browsing through the menu. 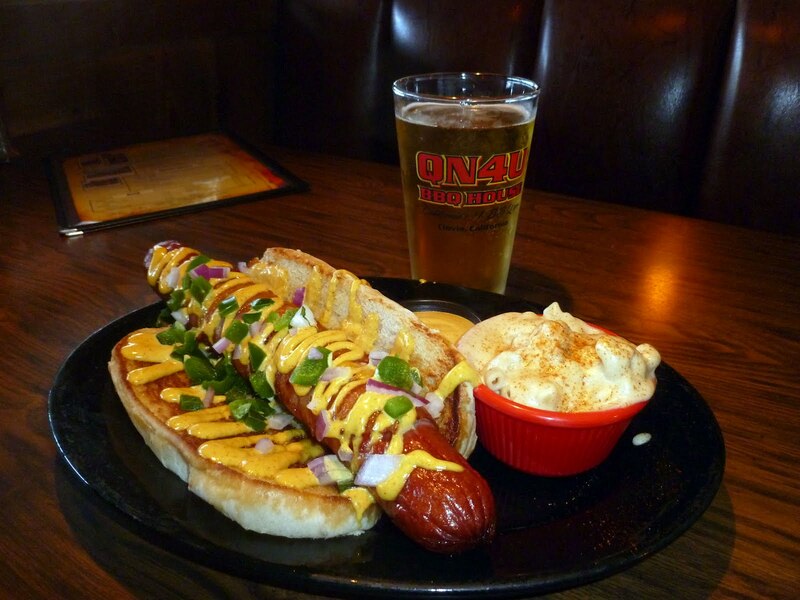 The “Texas Tommie” (The Worlds most outrageous hot dog). This is a giant, and I do mean giant hot dog stuffed with cheddar cheese and jalapenos, wrapped in bacon and deep fried. It is served on a bun with a special ‘Tommie Sauce”. This was just the warm- up dish. It was huge and very colorful. We only had a few bites because we needed to save room for the rest of the meal. A combination platter of pork ribs and ‘Burnt Ends’ brisket was up next. The Burnt Ends are meat candy that we love. 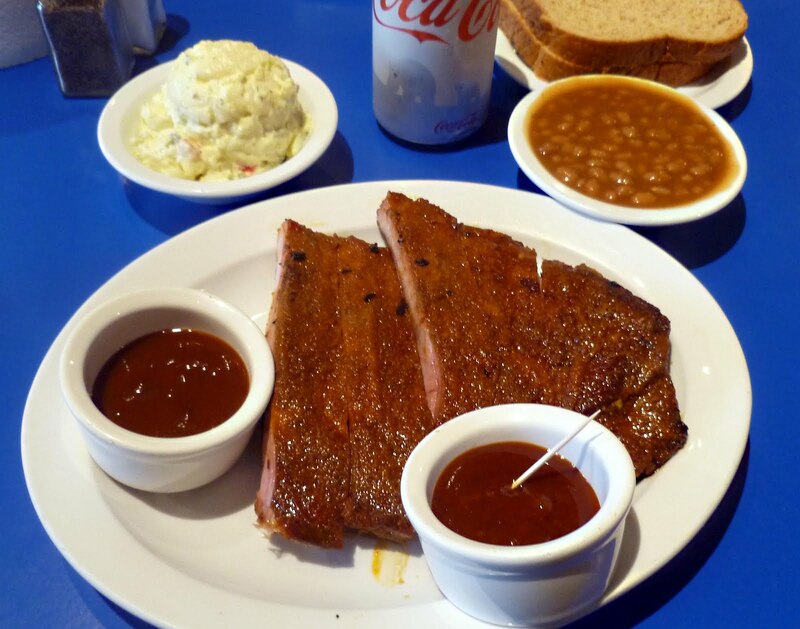 The ribs were tasty and done to perfection. The still moist cornbread muffins were served with sweet honey butter. Would I have room for the pecan pie? 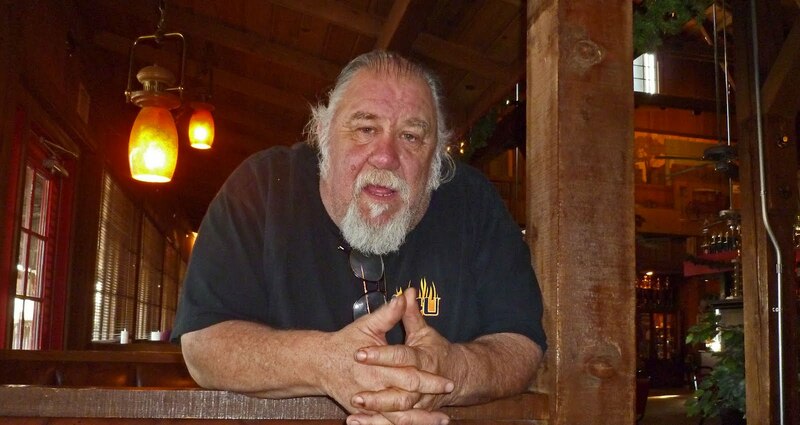 QN4U is run by multiple award winning pitmasters Brent & Kim Walton. Brent was gracious to come by our table and swap stories. He is a local celebrity. He has done local cooking shows and is auditioning for a national spot on ‘BBQ Pitmasters.’ Once again we had a great meal. It was fun to talk to Brent. We hope to return soon. 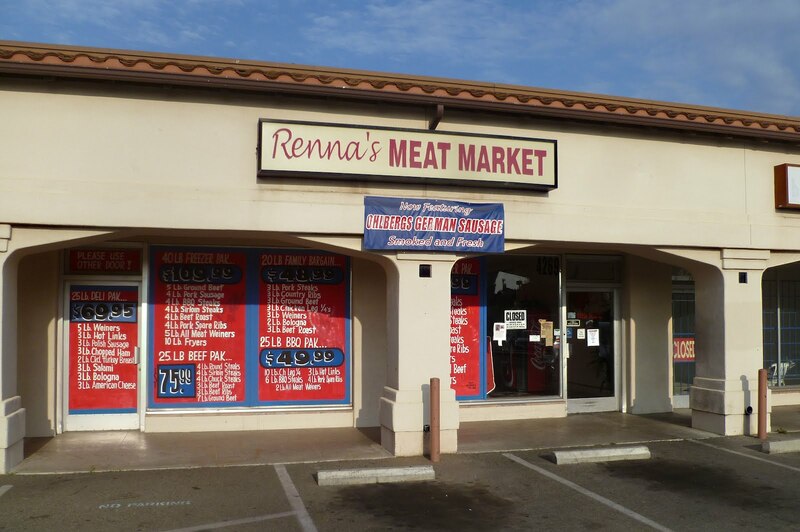 We purchased an assortment of sausages and headed back home. Pizza sounded like a great idea to try our bounty of fresh sausage. Dough and sauce made from scratch, fresh mushrooms, grated cheese and thinly slice onions would be ingredients for this pie. The Volga German sausage was cooked on the grill to add a little smoke flavor. An almond wood fire was started in our wood fire oven. Once the coals were glowing the pie was cooked for less than 3 minutes. 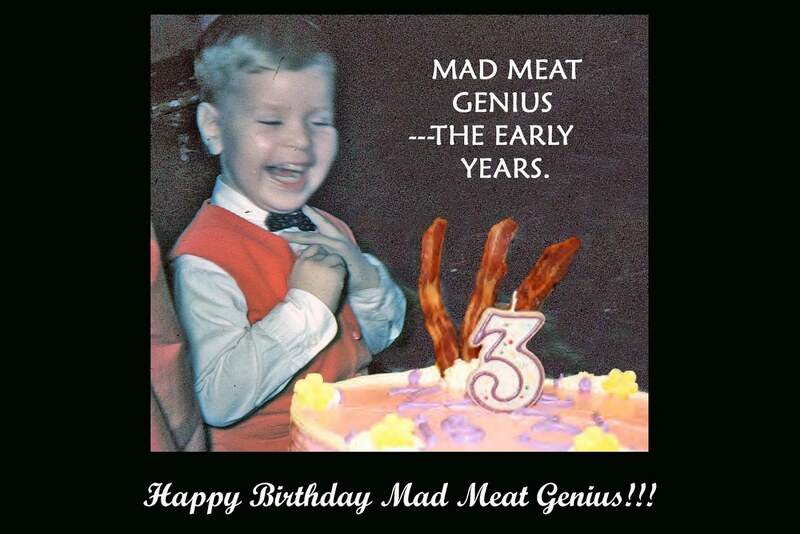 We will now share a Mad Meat Genius exclusive video. This video is three minutes long, the time it took to cook this pie. This is a work in process. The sound and lighting will need some work. This is a rare image of Chilebrown. You will notice that my face was made exclusively for radio. I did want to share how fast and furious pizza pie making is at our household. By the way the sausage was excellent and the pizza even better. Enjoy!